Engulfed in flames, he walked his hands clasped in prayers, raising slogans. After hundreds steps, he fell to the ground near a monument of a lotus flower. Info: [ RFA ] "He set himself on fire at a tri-road crossing in Pema county near the eight petal lotus monument made of mud," one source told RFA's Tibetan service. "With his body on fire, he walked about 300 steps with hands folded in prayer posture, and raised slogans before he collapsed dead on the ground," the source said. Tibetan self-immolator Lobsang Gendun in an undated photo. DHARAMSHALA, December 4: Minutes before setting himself on fire, Tibetan self-immolator Lobsang Gendun left a message of hope for the unity and solidarity of all Tibetans. According to Tsangyang Gyatso, an exiled Tibetan with contacts in the region, Lobsang Gendun called a friend of his, moments before burning himself to death, and left a message of unity to all Tibetans. 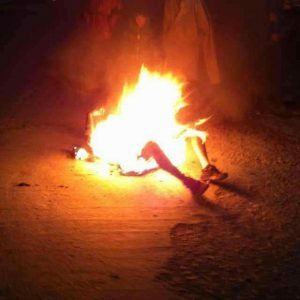 Lobsang Gendun, 29, a monk, at the Penag Monastery, self-immolated in Golog Pema region of eastern Tibet at around 7:45 pm (local time) Monday, December 3. He succumbed to his injuries at the site of his protest. According to eyewitnesses, Lobsang Gendun’s hands were clasped in prayers as he raised slogans urging Tibetan to be united and avoid in fighting, while engulfed in flames. His charred body was later carried to the Penag Monastery by local Tibetans following a minor scuffle with Chinese security personnel. Gyatso told Phayul that following the self-immolation protest, a respected Tibetan from the region, Washul Dodrub was detained by Chinese authorities in connection with the protest. Dodrub was earlier arrested in 2008, during the pan-Tibet uprising, on suspicion of leading protests in the region. His current wellbeing and whereabouts are not known. According to the same source, a large number of monks and local Tibetans visited Penag Monastery today to pay their last respects and prayers and offer their condolences and solidarity with the deceased’s family members. “Around one thousand of those visitors also pledged to fulfill Lobsang Gendun’s last wishes of harbouring unity and solidarity,” Gyatso said. Preparations have been made to carry out Lobsang Gendun’s final rites on December 5. Reportedly, many Tibetans from the nearby areas have been barred from travelling to Penag, by Chinese authorities, fearing further protests. Lobsang Gendun is survived by his parents, Golog Lokho and Sago Dewang, and his 11 siblings. An alarming total of 92 Tibetans have self-immolated inside Tibet since the wave of fiery protests began in 2009, demanding freedom and the return of His Holiness the Dalai Lama from exile. 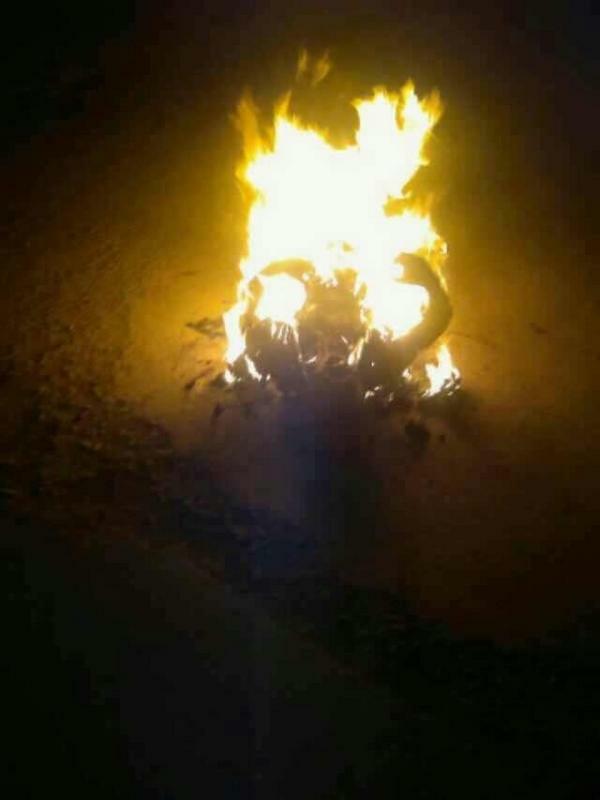 Following the self-immolation protest, a minor scuffle broke out between local Tibetans and Chinese security personnel, who tried to confiscate Lobsang Gendun’s body. They later carried Lobsang Gyatso’s body to his monastery, where it is believed to be currently kept. Security has been heightened in the region following today’s fiery protest. 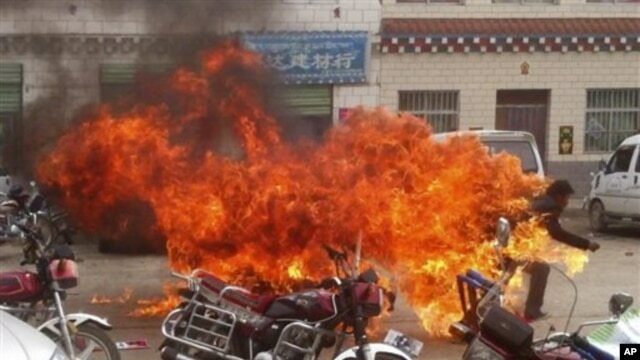 The global rights group, Human Rights Watch last week said the unprecedented increase in the number of self-immolation cases in Tibet highlights the “failure of Chinese authorities to address Tibetan grievances” and blamed China’s “increasingly pervasive and punitive security measures” for having “exacerbated the situation” in Tibet. Lobsang Gedun engulfed in flames, Dec 3, 2012. A Tibetan monk set himself ablaze in protest against Beijing's rule and walked an incredible 300 steps with hands folded in prayer before he collapsed and died, according to sources. 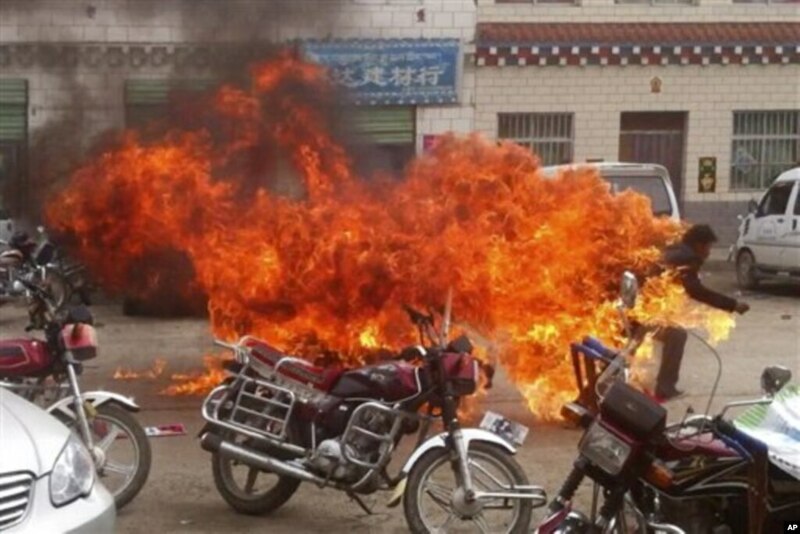 Chinese security forces and Tibetan residents tussled over custody of the body of Lobsang Gendun, 29, after he self-immolated at around 7 p.m. local time in Qinghai province's Pema (in Chinese, Banma) county, said the sources, speaking from inside Tibet. "He set himself on fire at a tri-road crossing in Pema county near the eight petal lotus monument made of mud," one source told RFA's Tibetan service. "At that moment, the Chinese police and PSB [Public Security Bureau officers] arrived at the scene and attempted to take his body away. However, the local Tibetans managed to wrest his body away from the Chinese and brought it to a monastery," explained the source. Lobsang Gendun was attached to Penak monastery in Pema county, which sources said has been put under strict surveillance following the latest self-immolation. "Several hundred Chinese police and armed PSB have encircled Pema county center and imposed stringent restrictions on the locals," a Tibetan living in exile in India's Dharamsala hill town said, quoting local contacts. The latest burning brings to 92 the total number of Tibetan self-immolations since February 2009, when the fiery protests began. Meanwhile, a 29-year-old Tibetan man who self-immolated on Friday in the Ngaba (in Chinese, Aba) Tibetan Autonomous Prefecture in Sichuan province and was whisked away immediately by Chinese security forces is presumed dead, sources said Monday. Kunchok Kyap "is now presumed dead as the Chinese authorities on December 1 [Saturday] returned his ashes to his family, following which monks and laymen of all ages gathered to pray for his departed soul," one source said. Most of the self-immolation protests have been aimed at highlighting opposition to Chinese rule and seeking the return of the Dalai Lama, who fled to India from Tibet after a failed national revolt against Chinese occupation in 1959. Chinese authorities have beefed up security and clamped down on the Internet and other communications in most of the areas where self-immolations have occurred, sources said. 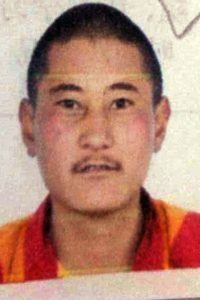 Lobsang Gendun, a 29-year-old Tibetan monk self-immolated in Golog Pema Dzong at around 7:45 pm (local time). He succumbed to his injuries at the site of his protest. According to eyewitnesses, Lobsang Gendun had his hands clasped in prayers as he raised slogans while engulfed in flames. Following the self-immolation protest, a minor scuffle broke out between local Tibetans and Chinese security personnel, who tried to confiscate Lobsang Gendun’s body. Chinese security personnel arrived at the site of the protest and began to forcibly remove Lobsang Gyatso’s body, but local Tibetans rushed in and rescued his charred body from falling into the hands of the Chinese authorities. They later carried Lobsang Gyatso’s body to his monastery, where it is believed to be currently kept. Security has been heightened in the region following today’s fiery protest. A Tibetan monk set himself on fire today (7:30pm local time)in Pema,Golok. (Pema county, Golok Tibetan Autonomous Prefecture, Qinghai province). till alive when police took him away. his condition is unknown right now.